On behalf of the Alliance for Equity in Higher Education—which includes the member institutions of the American Indian Higher Education Consortium (AIHEC), the Hispanic Association of Colleges and Universities (HACU), and the National Association for Equal Opportunity in Higher Education (NAFEO)—we are writing to urge you to issue a Presidential Executive Order establishing a President’s Board of Advisors on Hispanic-Serving Institutions (HSIs). As you know, there are currently two Executive Orders that you have signed to advance the important work of Historically Black Colleges and Universities (HBCUs) and Tribal Colleges and Universities (TCUs): Executive Order 13256, signed on February 2, 2002, which supports and renews the President’s Board of Advisors on Historically Black Colleges and Universities; and Executive Order 13270, signed on July 3, 2002, which supports and renews the President’s Board of Advisors on Tribal Colleges and Universities. These two Executive Orders are vital to the cause of equalizing educational opportunity for African American and Native American students in our country. They work to ensure that the Federal government coordinates activities across agencies to enhance the capacity of HBCUs and TCUs to serve students and communities effectively and efficiently. The lack of a President’s Board of Advisors on Hispanic-Serving Institutions is a critical omission. We urge you to correct this omission and provide the same type of support and encouragement to Hispanic students and institutions that serve them as you have already appropriately done to support African American and Native American students. 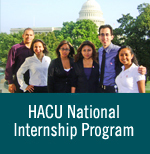 The Alliance for Equity in Higher Education was created in 1999 by NAFEO, AIHEC, and HACU as a means of promoting greater collaboration and cooperation among colleges and universities that serve large numbers of students of color. In addition to providing a quality education, our institutions are well-known for their ability to foster cultural values and traditions, promote civic and community responsibility, and produce citizens who are exceptionally attuned to the increasingly diverse country in which we live. To this end, the Alliance for Equity in Higher Education unites our diverse communities and institutions in order to enhance the nation’s economic competitiveness, social stability, and cultural richness. We believe that the creation of a President’s Board of Advisors on Hispanic-Serving Institutions would be an important signal to the nation about your commitment to these goals. Thank you for your consideration of this request.